Generally the Australian Kelpies are a healthy breed. Although now, over the past few years, some health problems are now becoming evident in the breed with more breeders networking. Because the Kelpie genetic pool is becoming smaller and some breeders are breeding far too close - e.g. half brother/sister, uncle/niece, father/daughter matings - genetic problems will eventually show up down the track. The DNA test for CA is still being sought. The research has been a slow process as there has been difficulty in locating the gene concerned causing the CA. I receive updates from the University in Helsinki on how the research is progressing. If anyone would like any updates on CA please do not hesitate to contact me. Information has come to hand that CA has been produced in a number of litters of puppies from the show bred and working dog lines both overseas and here in Australia as far back as the 1950's. rRecently another CA litter has just been bred in Europe. CA is in the Kelpie breed and anyone purchasing a puppy should ask the breeder of the puppy they are about to acquire are they aware of any health problems in the breeding lines. Australian Kelpies have also been found to have other problems such as epilipsy and lupis disease. There also has been a number of cases of heart problems reported - my information is sourced from a number of different breeders in Europe, Australia and various web sites. To date at least thirty cases have been recorded in Europe. For the past nine years, with the help of another breeder, we have been trying to help organise a DNA Test for the Kelpies. The University of NSW had under taken the research up until Alan Wilton passed away at a very young age (R.I.P.). NSW Univerity did not wish to carry on Alan's work and was going to dispose of all the Kelpie samples that had been sent in for the research. Alan's partner rescued the samples and had them stored at the Sydney University for safe keeping. After months of negotiations with Sydney University and without reaching an agreement regarding the reserach we walked away from Sydney University. The reason that we walked away from Sydney University research department are quite in depth and involved. If anyone is interested in finding out all the facts on why a further donation of $75,000.00, for a full time research person was withdrawn by Terry Snow they need be aware of the full story. Terry Snow had already donated $50,000.00 towards the research previously to NSW University. After months of networking with various breeders and other interested parties, Hannes Lohi from the University of Helsinki contacted me and from there these researchers in Finland are working on a DNA Test for the Kelpie. A number of breeders have obtained all their blood samples, etc. back from the Sydney University research program and sent these over to Hannes Lohi in Finland to help with this research. To date Hannes Lohi has found TWO STRAINS of CA in the Australian Kelpie and has already found the CA gene in the Finnish Hound. If any breeders are aware of litters or dogs that are affected - I am sure that Hannes Lohi would be most greatful if samples could be sent to the Helsinki University in Finland to help towards the research. Hannes Lohi is looking for affected dogs and brain tissue samples. We have here the paperwork, sent to me by Hannes Lohi, which is required to send samples for quarantine purposes to Finland. Anyone wishing copies of these documents please contact me. Around Europe show rings apparently there are discussions going around blaming Australian breeders for CA problems. PLEASE BE AWARE that NO ONE BREEDER is to blame. To those breeders out there that continually blame others please remember that these CA problems go way back a far as the 1950's. The breeders that are to blame are those that have told untruths and have deliberately hidden the fact that they continue to breed dogs that have either produced or are suspect dogs. An older breeder, that no longer breeds Kelpies, has given me some valuable information on where some of these CA problems could have possibly started. If breeders had stopped breeding sick dogs back then in the 1950's we would not be in the position that we are today. How the CA crosses over from the mother to puppies - father to puppies is still not clear. All we are aware of is that both the mother and father of the litter have to be carriers to produce a litter of CA puppies. When the litter is born, if both parents are carriers, then there will be affected puppies born. The litter of puppies are all fine until they reach the age of around six weeks then they start to show signs of neurological problems such as head bobbing, high stepping, finding it hard to drink and eat, falling over and not being able to co-ordinate their legs. Eventually the puppies lose so much of their co-ordination it is too hard for them to eat or drink the kindest solution is to put the puppies to sleep. This CA problem can be seen in the Kelpie in later years. The working Kelpies now have 90% of their dogs with at least one carrier in their pedigrees. The dogs that are shown in the conformation ring we do not know the percentages as yet but there are now at least seven breeding kennels that I am aware of here in Australia that have had CA litters or affected dogs in their breeding programs. The truth will eventually come out when the DNA Test is found and all dogs need to be tested for CA. Anyone wishing further information please contact via email. BEFORE PURCHASING A PUPPY FROM A BREEDER PLEASE DISCUSS WITH THEM DO THEY OR HAVE THEY HAD ANY NEUROLOGICAL PROBLEMS OR HEALTH ISSUES WITH THEIR DOGS. Below are results for hip scores for some of the Wingdari bred dogs. AUST. SUPREME GRAND CHAMPION WINGDARI BUSH XMAS "Chelsea"
POHJV-05/JV-03/FIN MVA FINNISH CH. 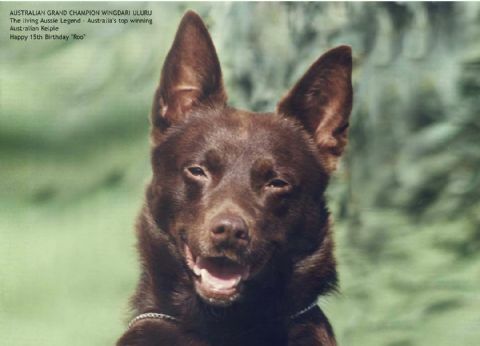 WINGDARI SWAGA MISCHIEF "Vilkuu"
NV-07 NORWAY UCH WINGDARI SHEARERS MATILDA "Tilly"
KORAD WINGDARI XMAS DOWNUNDER "Winnie"
HIPS: X-rayed August 1996 = Grade B HAEMOPHILIA IN THE AUSTRALIAN KELPIE Unfortunately there has been produced a litter of Kelpies with Haemophilia A. The breeder concerned has done everything in their power to research this problem and to try and resolve what lines carry this gene. I give full credit to this breeder for being open and honest and advising other breeders and interested people know that Haemophilia has now been found in the Australian Kelpie. It is by the honesty of this breeder that we can move forward and improve the health and wellbeing of our wonderful Australian Kelpie. Please discuss this problem with your veterinary surgeon and also go to the internet and do research on why and how this problem occurs. I am also sure that if you are interested in finding out further information on how the research is progressing please email me and I will put you in touch with the breeder concerned.